Dec 15, 2016: Sennheiser Game One + Creative Sound Blaster G5? Jul 13, 2017: How good are the Cloud II's for this game? Jul 13, 2017: Need some new headphones, help a brother out! Aug 11, 2017: I need a new headset, but the ones I've tried sound like crap compared to my old one. What should I get? Dec 09, 2017: Most comfortable headset? Dec 13, 2017: Looking for a good headphone brand. 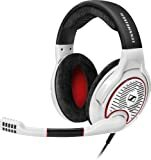 Dec 17, 2018: What's your favorite gaming headset for WoW?